It’s been a little over 3 months since some rogue members of the Turkish military failed to oust President Erdogan in their spectacular coup attempt last July, and the passage of time has allowed many analysts to more calmly assess what happened during this dramatic time and fully investigate its origins. This review aims to reevaluate the motivations for the regime change attempt and argues that the US exploited sharp preexisting differences within Turkey’s military, elite, and society in order to instigate the coup for envisioned zero-sum geostrategic ends against Russia. There was a long-standing illusion that Turkey was a Western-modelled liberal-democracy before the coup attempt and subsequent crackdown, but that presumption doesn’t accurately capture the transformational processes that have occurred since Erdogan first rose to power in 2003. Outside observers that don’t closely follow Turkish domestic politics might naïvely have assumed that Turkey’s prior form of governance would be unchanging due to its NATO membership, EU aspirations, and US partnership, but none of these three are necessary prerequisites for an enduring liberal democracy. What’s been happening in Turkey over the past 13 years is that the country has been transitioning from a secular western liberal democracy to an Islamist “national democracy”, with the former only remaining as a shell of its older self in order to barely disguise the core of the latter. The only other famously regarded Islamic Democracy is Iran’s, though that one is formally a republic and is relatively more open than Turkey’s. Erdogan is known as an admirer of the Muslim Brotherhood ideology, so it’s likely that the comparatively more centralized characteristics of his evolving model are due to the influence that this organization has had on him. The Turkish President formally hosted the group after its 2014 expulsion from Qatar, and prior to that, his 2011 “Arab Spring” “victory tour” to Egypt, Libya, and Tunisia showed that he has long held a desire to lead the countries where he expected the Muslim Brotherhood to usurp power after their successful regime change operations. As part of his Islamist mission, Erdogan wants to change the secular constitution that Turkey’s modern-day founder Kemal Mustafa Ataturk implemented, which critics fear will result in the imposition of a Salafist-style state on all Turks that would then pressure them to accept a religious socio-political system through various means of coercion. In all fairness, however, the 20th-century secular state of Turkey is an historical anomaly for its people considering that they had lived for centuries under the caliphate, yet Ataturk’s reforms were so successful that secularity became a defining feature of Turkey’s national identity and came to symbolize its rapid modernization in socio-political terms. Turkey maintained this system until after the Cold War, when rural society began to progressively Islamify much to the dismay of the secular urbanites. The eventual outcome of this process was that the majority of the country came to embrace the outward expression of religion, particularly in the socio-political form, and they were the reason why Erdogan’s AK Party came to power in the first place in 2003. Erdogan represented the formal politicization of this trend, but he knew that he had to proceed incrementally with his vision so as not to scare the remaining members of the secular society, his country’s international (Western) partners, and the military. At the same time, though, Erdogan didn’t hide his Islamization intentions, and this spurred a predictable reaction from some members of Turkey’s “deep state”, or its permanent military, intelligence, and diplomatic bureaucracies. The military has a long tradition of coups, especially those that were meant to safeguard the country’s constitutional secularity, which is why Erdogan didn’t move as fast as he wanted to with his plans and instead spent the past 13 years steadily dismantling this “deep state” infrastructure. The series of domestic scandals during this time were symptomatic of just how fierce the “deep state” war had become, since these sorts of conflicts are never meant to spill out into the public domain unless they absolutely have to. The reason that such scandals as these happened is because Erdogan wasn’t just confronting the formal “deep state”, but also the informal one as represented by non-state actors such as the Gulenists that are ideologically opposed to his rule. Sometimes these individuals and sympathizers would infiltrate into “deep state” institutions, but other times they’d be embedded in the media and academic spheres. Erdogan’s quest to rid the country of all formidable regime change opposition to his rule defined his time in power thus far. For as power-hungry and radically transformational as Erdogan and the AK Party might be, one shouldn’t lose sight of the ‘inconvenient’ fact that they’re still the democratically elected and legitimate government of the country that represents the electoral desires of the Turkish majority. 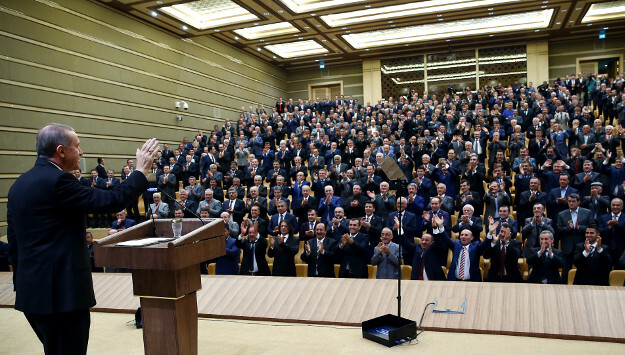 Even so, Erdogan’s polices were indeed polarizing, and he came to symbolize what the opposition saw as an existential threat to the Turkish Republic. The crux of the problem is that the Islamifying AK Party stands against the secularization enshrined in the Turkish Constitution, which thus puts them at immeasurable odds with all secularists, some of the military, and the Gulenists who conspired to exploit these preexisting socio-political tensions for their own regime change ends. 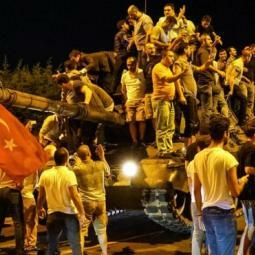 This was the domestic climate in Turkey on the eve of the coup attempt, but nothing would have happened had it not been for the geopolitical trigger that Erdogan himself unwittingly pulled and which prompted the US to encourage the coup plotters to make a decisive move against his government. None of Erdogan’s centralizing Islamization policies would have mattered to the West, NATO, and the US on a high-level strategic plane so long a Turkey still continued to support their Mideast policies. In fact, the case can even be made that an Islamifying Turkey is beneficial to the US if one understands the “Arab Spring” as a theater-wide Salafist Color Revolution and Turkey as the envisioned “Lead From Behind” hegemon of a constellation of Muslim Brotherhood governments. This didn’t pan out as expected because the historically secular Syrian people stoutly refused to fall for this foreign-concocted regime change plot and stood firmly behind their government, though the US and Turkey obviously didn’t take their refusal for an answer and thus commenced the ongoing War on Syria that continues to this day. The nature of that conflict has changed, however, because Turkey rapidly restored its strained relations with Russia after the tense freeze that followed the shooting down of the Russian anti-terrorist jet over Syria, and this has served as a major game-changer in the US’ Mideast calculations. Erdogan’s initiative didn’t occur in a vacuum, but played out in response to the US-Turkish strategic divergence that eventually widened over the War on Syria, particularly as it relates to the Kurds. Turkey had been fighting a long-running war against the PKK since the 1970s, with only a brief intermission over the past couple of years, but the conflict was reignited because of two driving factors. The first is that the Turkish Kurds were encouraged by the anti-Daesh gains of their Syrian and Iraqi brethren and the international sympathy and support that followed, while the second is that Erdogan decided to “rough up” the Kurds a bit as an electioneering tactic before the second round of voting in order to attract the MHP nationalist vote (which he succeeded in winning). All the while this was happening and even beforehand, the US was providing the Syrian and Iraqi Kurds with weapons, training, supplies, airstrikes, and special forces assistance. What predictably followed was a classic security dilemma between the US and Turkey. Ankara truly believed that the US wasn’t just trying to defeat Daesh, but also had ulterior motives in in helping the Kurds craft a sub-state transnational “Kurdistan” between Syria and Iraq. This prospective polity would allow the US to powerfully pressure Turkey. Ankara views the YPG Syrian Kurdish militia as a terrorist group inseparable from the PKK, so Turkey understandably identifies the creation of this entity as a terrorist state along its southern borderland and thus lost its erstwhile blind trust in the US. 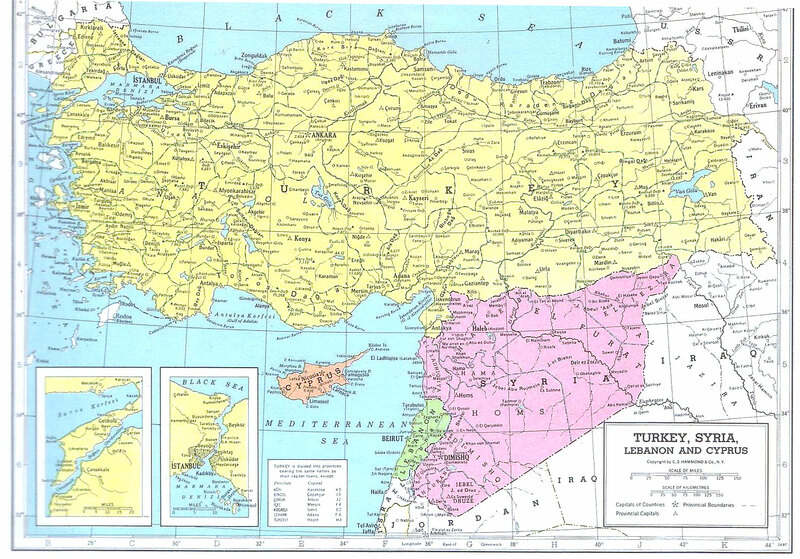 “Kurdistan” is an existential threat to the Turkish Republic, but it also endangers the grand strategic designs of Syria, Russia, and Iran, which quietly agree that this pro-American proxy state would be nothing less than a “second geopolitical ‘Israel’” in the heart of the Mideast. It’s the convergence of Turkey and Russia’s threat assessments vis-a-vis “Kurdistan” that spurred the lightning-fast political reset between both sides. The Russian-Turkish rapprochement is a fundamental game-changer for undermining the US’ Mideast strategy because of the potential that it has to morph into a quadrilateral coordination platform between Russia, Turkey, Iran, and Syria. Moreover, the restoration of positive Russian-Turkish relations also allows for Iranian-Turkish ties to become strengthened too, given the shared interest that Moscow and Tehran have in fighting terrorism in Syria. The linking of the Russian, Iranian, and Turkish Great Powers is referred to by the author as the Tripartite, and an earlier article series for Katehon explored the broad geopolitical potential that this new power grouping has to reverse the destabilization that the US has wreaked all across the “Eurasian Balkans”. Additionally, it shouldn’t be forgotten that each member of the Tripartite has their own New Silk Road relationship with China, so one can expect for Beijing to use this renewed period of multilateral Great Power pragmatism to its world-changing advantage by seeking to advance the transnational multipolar connective infrastructure projects that are collectively referred to as the One Belt One Road (OBOR) vision. All of this is a nightmare for US strategists, which is why they felt immediately compelled to act against the catalyst of this profound scenario forecast by stopping Erdogan in his tracks before he could take Turkey further down the path of multipolarity. US intelligence agencies, by the very nature of doing the job that they’re tasked to perform, obviously have influence within and access to the Turkish “deep state”, which was made even easier to acquire in this case because of the country’s NATO membership and its “Lead From Behind” position in the War on Syria. They accordingly took advantage of the antecedent cleavages in Turkey’s socio-political systems in order to encourage the coup plotters to prematurely execute their plans before they were even ready, assuring them that they’d succeed because the CIA would direct the entire operation from an island in the Sea of Marmara and even provide them with Erdogan’s coordinates so that he could be assassinated. * and the growing international suspicion surrounding Turkey for its centralized Islamization, its support of Daesh, and its role in facilitating the Immigrant Crisis, all of which were ironically brought to global attention by the efforts of Russia’s international media outlets. These four factors alone wouldn’t have been enough for the US to throw its backing behind the coup preparations that certain actors were already undertaking against Erdogan so long as Washington thought that it could still control Ankara, but the rapid renewal of Russian-Turkish relations made the US second guess the submissive loyalty of its Mideast underling and thus served as the geopolitical impetus for abruptly setting the regime change events into motion. The coup ultimately failed though because Erdogan was tipped off about it at the last minute, dramatically escaping death to iconically rally his people through a nationally televised iPhone Facetime message to take to the streets in his support. Whether he recognized it or not, this was an implementation of Reverse Color Revolution technology, in which traditional Color Revolution tactics such as street protests are used not for the purpose of regime change, but for ‘regime reinforcement’. Despite victoriously regaining power shortly thereafter, Erdogan had a much tougher time deflecting the fallback damage control narrative that the US began to spin in the aftermath of its failed operation. Washington and its affiliated international mainstream media outlets began to promote the conspiracy theory that Erdogan had staged the coup himself in order to gain more power, and this clever suggestion quickly caught on even among many alternative media supporters, commentators, and outlets. People fell for this ruse because it took perfect advantage of the information backdrop that Russian international broadcasters themselves had previously promoted during the times of Russian-Turkish tensions, chiefly that Erdogan is a dangerous Islamifying ‘dictator’ who will stop at nothing in his lust for power, including supporting Daesh terrorists in Syria. All of this is factually true, but the problem with media and policy is that the former doesn’t predict nor can elegantly accommodate for pivotal changes in the latter, which is why many people were suddenly left scratching their heads and wondering why Russia would all of a sudden team up with the same ‘tyrant’ that it had previously despised. To simply explain it, Russia does not have a “state-controlled media” in the same sense as the West does, as surprising as this may seem to many. Although RT and Sputnik are publicly funded, they are not directly controlled by the Kremlin or any other Russian decision-making “deep state” organs. In contrast, Western “private” media companies such as CNN, the Washington Post, and the New York Times are paradoxically under an even more intense degree of state influence that they accuse their Russian counterparts of being exposed to. This is why, for example, there were differing narratives about the origins of the coup plot and its normative legitimacy in both of these aforementioned Russian outlets, because plainly enough, they allow for a diversity of viewpoints and are not “state-controlled”. If they were, then they would have been able to more flexibly adapt their messaging before, during, and after the US-backed coup in order to account for the rapid Russian-Turkish rapprochement and clearly explain the geopolitical underpinnings of this to their audience so that they wouldn’t be as confused as many of them still are. The West has no such problems in this regard because they don’t have “free speech”, no matter how much they claim the contrary, and this is proven beyond a doubt by the consensual narrative that they all spewed in unison about how Erdogan purportedly faked his own coup in order to seize more power. The author thoroughly debunked this claim in a previous article about “Why The Failed Turkish Coup Attempt Wasn’t A “False Flag” Power Grab By Erdogan”, and the reader is welcomed to read it in full if they’re interested in a more comprehensive explanation about this, but there are a very relevant details pertaining to it which should be mentioned at this time. The first is that Erdogan’s power centralization had already been occurring for a long time before this happened, and that he was already doing it in such a systematic way that it should have been obvious to all that he had previously identified his targets well in advance. The failed coup attempt just gave Erdogan a mandate to accelerate this process and to carry it out more publicly without fear of significant protests against him (which he could use the state of emergency to quell). On top of that, the enthusiastically supportive reaction of Russia and especially Iran to Erdogan’s successful victory over the coup plotter speaks volumes about these state’s analyses of the situation. Quite clearly, both of them calculated that it’s much better for their own respective and collective interests (especially in regards to Syria) for Erdogan to remain in power than if he were replaced in a US-orchestrated coup. Even more convincing was the very mild reaction that each of them gave to Turkey’s military involvement in northern Syria, which could logically be taken to mean that they had previous knowledge about it and tacitly supported (if not coordinated) this move in order to disrupt the creation of the US’ “second geopolitical ‘Israel’” of “Kurdistan”. Having come to a clearer understanding about the origins of the US-backed coup attempt against Erdogan, it’s now possible to forecast the path that Turkey will tread in the future. Ankara won’t totally ditch the US, EU, West, and NATO, but it knows that it is impossible for it to join the European integrational bloc in the post-Brexit reality, especially given Turkey’s complicity in engineering the same Immigrant Crisis that contributed to London’s voluntary removal from the organization. What it will do, however, is move closer to the multipolar world in response, and this could take the form of strengthened multidimensional cooperation with the Tripartite and/or broader multilateral engagement with the SCO and BRICS. The most dramatic expression of the Tripartite would be if Russia, Iran, Turkey, and Syria were to openly coordinate their anti-Daesh activity in the Arab Republic. Each of the Great Powers already have their own separate type of military forces presently active in the country which could effectively supplement one another if deployed in coordination. For example, Russia’s airpower would greatly augment the combat viability of Iran’s special forces, Turkey’s tanks, and Syria’s conventional troops, but the problem is that none of these actors are multilaterally working together for these ends. Syria is bilaterally coordinating its liberation offensives with Russia and Iran, but it doesn’t appear as though Moscow and Tehran are directly working together with one another. Damascus doesn’t seem to have any influence over what Ankara is doing in northern Syria, whereas Russia and Iran look to be dealing with their Turkish Great Power peer and handling this on Syria’s behalf. What’s needed is for all four countries to get together, pool the available military resources that they have the political will to commit, and push aside the US’ “anti-terrorist” coalition in beating Washington in the “Race for Raqqa”. Even if Erdogan doesn’t team up with Putin, Rouhani/Ayatollah, and Assad in taking out Daesh, he’s still committed an unpardonable sin in the eyes of the US by surviving the coup and normalizing relations with Moscow and Tehran. It’s now clear to all that since the US fatefully chose Gulen and the Kurds over Erdogan, the Turkish strongman is rightly convinced that Washington will continue to use these two non-state actors against him in the coming future. The most obvious way that this can happen is through an emboldened Kurdish insurgency in southeastern Turkey, fought by American-trained “Peshmerga” and YPG forces which were directly supplied by the Pentagon ostensibly under the pretenses of “fighting Daesh”. Related to this, the leftist terrorism that plagued the country during the 1970s might return as well, to say nothing of Daesh itself turning more fiercely against its former patron. It also can’t be ruled out that Erdogan’s plans to revise the constitution in order to strengthen the presidency and formally Islamify the state could serve as a trigger for another Color Revolution attempt against him. Whether all of these scenarios are ‘naturally occurring’ or predetermined processes encouraged and/or orchestrated by the US for geopolitical purposes, they all have the likelihood to individually or collectively become self-perpetuating and enter into a state of auto-synchronization that fulfills the neoconservative weaponization of chaos theory. The Hybrid Wars that could break out against Turkey would be predicted on the theoretical law that determines the course of these conflicts, which is to disrupt, control, or influence multipolar transnational connective infrastructure projects through the exploitation of identity conflicts. Turkey is pivotally situated at the Eurasian crossroads that invaluably connect Asian energy resources and commercial trade to Europe, thus giving it a heightened position in both Iran and China’s grand strategies, respectively. Turkey needs to retain stability within its borders and pacify the southeast so that the New Silk Road could travel into the country from Iran and fortify Beijing’s globally transformational plans to re-engineer Eurasian geopolitics. Even if Erdogan achieves his goal of controlling the Turkish Kurds, he might never be able to fully keep a lid on the domestic dissent that’s bound to incessantly sizzle so long as he pursues his constitutional plans to formalize the Islamization of his society. The Color Revolution plots that will undoubtedly spring up in reaction to this might be put down by the Turkish security services, but they’ll at least accomplish the mission of painting Erdogan out to be an “Islamic dictator” who in the eyes of the Western audience is long overdue for removal. The chief irony of the Turkish story over the past five years looks to be that the unipolar country bit off much more than it could chew in the War on Syria, and now its “deep state” has recanted and begun to veer in the direction of multipolarity out of the self-interested desire to preserve its own strategic security. Turkey’s American patron turned on it by choosing the Kurds over Erdogan, and Ankara’s gambit in promoting its Neo-Ottoman interests at Damascus’ expense paradoxically ended up diminishing its own internal security and socio-political stability, made even worse by Erdogan’s polarizing drive towards centralized Islamization. Although weaker than it ever has been in its recent history, Turkey interestingly has more potential than anyone would have previously thought possible due to the advantages that it stands to reap from its pragmatic partnerships with the multipolar Great Powers of Russia, China, and Iran, though it remains to be seen whether the US will allow its former subordinate to taste the ‘forbidden fruit’ that Washington had forcibly withheld from it for generations.